Half of the top half of the Schweiss bifold door is clad in glass to allow a significant amount of natural light into the building. Glass alongside the bifold door extends down to the man door and gives it a unique look, as do the black insulated panels. 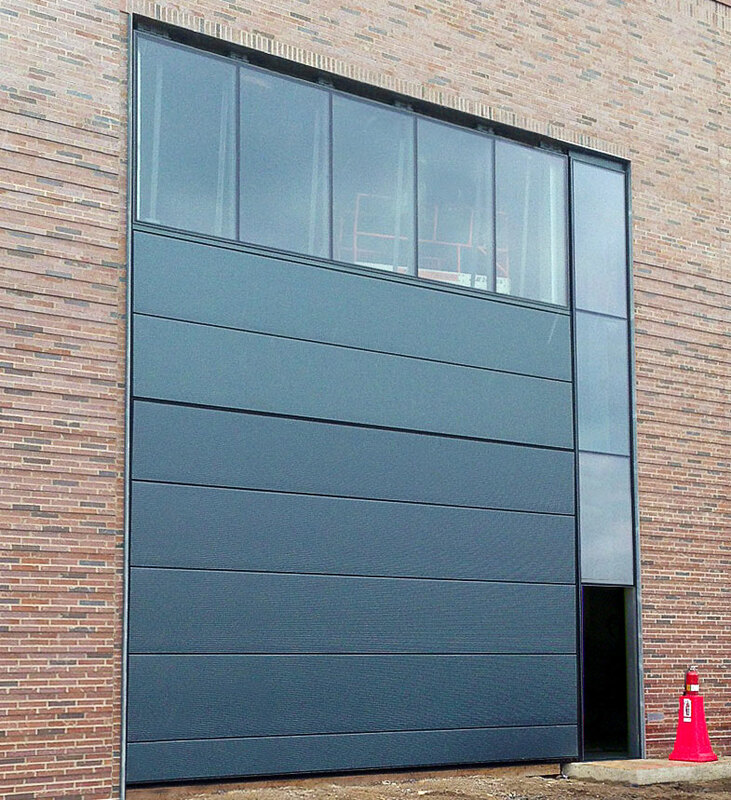 When the University of Minnesota decided on a new Physics and Nanotechnology Department building they looked to Schweiss Doors for a bifold door that would give them easy, but secure access. 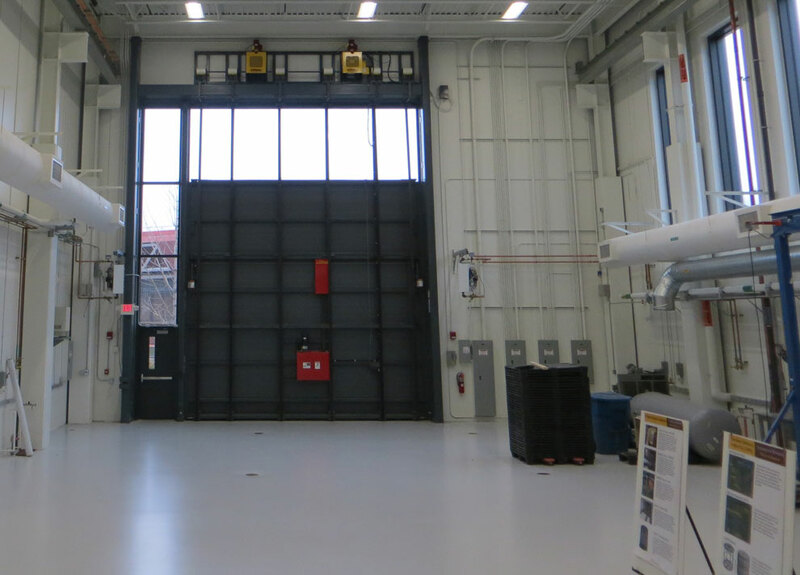 Randy Rennaker of Star Equipment in Blaine, MN said the door is used to bring in larger testing equipment into the building for experiments they are conducting. "It houses a lab room and is a big experimental area; it's the only main entrance into the experiment area. We hired a person from Schweiss Doors to work as an onsite installation supervisor. Jeremy (at Schweiss Doors) was also very helpful and the doors arrived on time and in good condition. The door is very good quality and I have recommended them to others," said Rennaker. 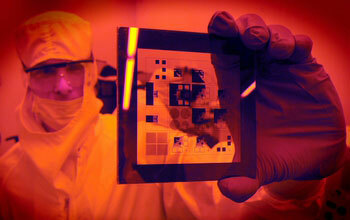 The U of M nanotechnology lab is one of the best in the nation. More than 15,000 square feet is dedicated to nanotechnology research, including a 5,000-square-foot, clean room facility. The building houses both the University College of Science and Engineering's School of Physics and Astronomy and the Minnesota Nano Center. It also features a unique high bay lab facility for large-scale physics experiments. The 144,000-square-foot, $84.5 million building includes 43,000 square feet for 40 modern and highly flexible physics laboratories and laboratory support space. Over $20 million of equipment is in place and operational for optical and electron beam lithography thin film deposition of metals, alloys, and ceramic compounds annealing, oxidation, and doping of substrates wet etching and reactive ion etching optical pattern (mask) development. 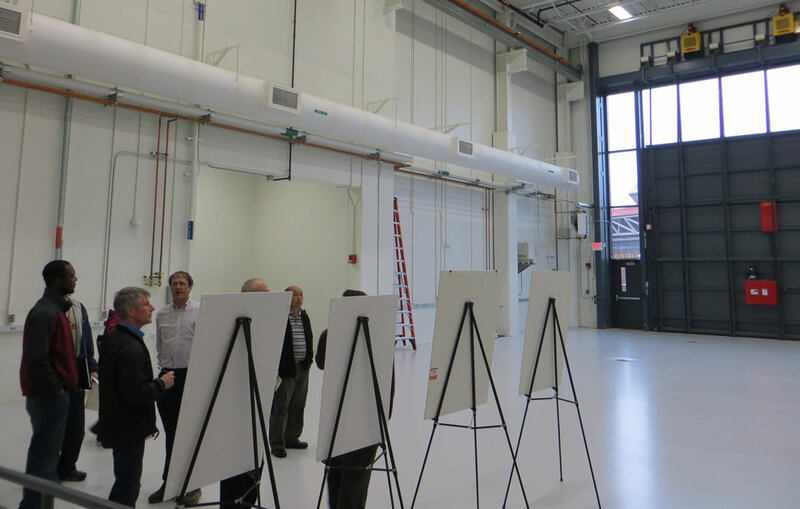 More than 15,000 square feet is dedicated to nanotechnology research, including a 5,000-square-foot, clean room facility with two Class 10 bays and three Class 100 bays. With its new space, the Minnesota Nano Center will offer expanded facilities for nanotechnology applications in biology, medicine, and advanced materials. 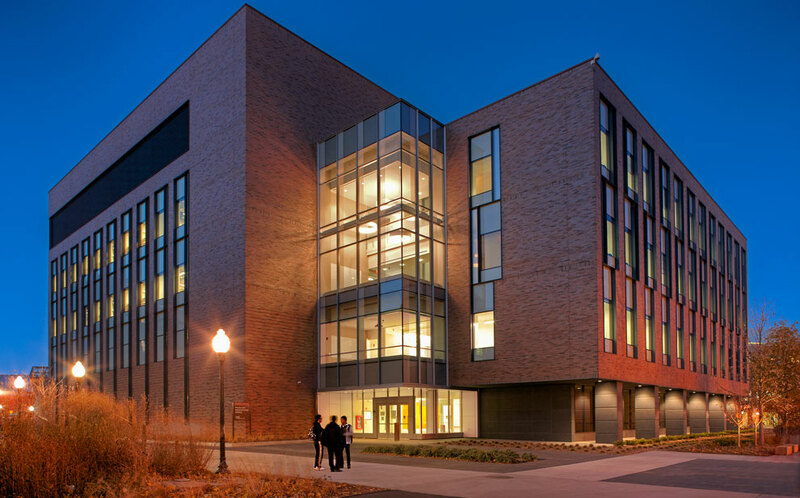 The new building accommodates about 200 faculty, graduate students, post-doctorate researchers, and visiting researchers in the School of Physics and Astronomy and the Minnesota Nano Center. More than 100 researchers from dozens of departments in several colleges throughout the University system will also use the nanotechnology facilities in this building. In addition, about 250 people from business and organizations across the country currently use the University's nanotech facilities. Zimmer Gunsul Frasca Architects, LLP, in association with Architectural Alliance, designed the state-of-the-art building, and Mortenson Construction served as general contractor on the project. More than 816 workers from various trades participated in constructing the building over a 24-month construction period. Star Equipment, Inc. is recognized as the upper Midwest's premier stocking distributor of loading dock equipment. Located in Blaine Minnesota, Star Equipment, Inc. has been providing sales, service, parts and technical expertise to customers in need of loading dock solutions and service and for door needs over two decades. Their attention to detail and uncompromised commitment to quality and service is truly a company culture. They are committed to making their customers operation a safer and more productive work environment while reducing the lifetime cost of ownership of capital investments. Star Equipment can help with all your door needs. They offer a broad range of doors from the finest manufacturers in the industry, and will work with you to determine the ideal door solution for your needs for Bifold and Hydraulic Doors, High Speed, Sectional Overhead, Traffic, Parking Garages, Cold Storage, Fire Doors, Man Doors and Impact Doors. For over two decades they've been installing and servicing all makes of doors. Fire door maintenance and drop testing has become increasingly important to stay compliant with current regulations and code. Service and maintenance programs are also available. ZGF Architects LLP, founded in Portland, Oregon, is a design firm with a focus on architecture, interior and urban design. The firm's design portfolio is intentionally diverse, ranging from transportation terminals, commercial office and mixed-use developments to corporate campuses, healthcare and research buildings, academic facilities, libraries, and museums. In addition to receiving more than 770 local, regional, and national design awards, ZGF was honored with the American Institute of Architects' highest honor, the Architecture Firm Award, recognized for "creatively transforming client needs and aspirations into elegant, inventive architectural form, and establishing a standard of excellence and expectation of quality to which other firms aspire." The firm has grown to include offices in Seattle, Los Angeles, Washington, DC, New York, and ZGF Cotter Architects Inc. in Vancouver, BC. ZGF's design philosophy is centered on the premise that design excellence should be reflected in each and every aspect of a building and relationship to its users, its building systems, and its cost. ZGF west coast office is located at 1223 SW Washington Street, Suite 200, Portland, Oregon. Phone: 503-224-3860. U of M scholars gathered within the building before the big equipment was in place inside. The automatic latching system is located at the center of the bifold door. Two top-drive motors and six liftstraps open and lock the door weather tight. With the bifold door nearly operational, all that's left is to attach the walk door to it. Housing both the U of M University College of Science and Engineering's School of Physics and Astronomy and the MNC, the 144,000-square-foot, $84.5 million building includes 43,000 square feet for 40 modern and highly flexible physics laboratories and support space.